Croydon girl who has put down roots in Bedfordshire, Katie is a clunky, messy, grainy, scrappy illustrator who loves texture and typography. Her tools of the trade are crayons, Indian ink and biros. She collates and refines her work digitally, a process which is heavily inspired by a love of printmaking found at university. Katie is a founding member of arts collective Art School Disco, and has exhibited worldwide. Kristina is an illustrator turned designer with a love of character and animation. Her work is primarily digital but she loves to experiment with new and inventive styles of drawing. Having worked freelance for several years, she’s now employed as a graphic designer for a local agency. However, she continues to nurture her passion for illustration through various freelance projects and her involvement with the Circus of Illustration. Andrew is born and based in Bedford. Andrew is qualified in graphic design and illustration and has studied at both Bath and Bedford College. He has loved drawing since he was little and continues to love it now that he is not so little. The majority of his illustrations are computer based using Adobe Illustrator and Photoshop. Emily’s approach to art comes from research-based foundations that celebrate historical and cultural contextual themes. Using pen and ink to create vivid character designs, Emily’s illustrations have been used locally and afar, including the Place Theatre and the Courtauld Institute of Art. Emily has also been creative consultant for Rogan’s Books prior to a visit from acclaimed author Philip Pullman, and dressed the shop interior with illustrations and artefacts from Pullman’s literary landscape. Marisa has been employed as an inhouse greeting cards designer since 2005. She specialises in cute, soft and cuddly characters as well as traditional floral and lifestyle scenes for Doodle Press Ltd, a design and illustration studio based in East Lancashire. Marisa likes to draw, she likes to sew and she likes to make things grow. Individually, we are professional working illustrators based in the Bedfordshire area. Collectively as the Circus of Illustration we are working towards being the ‘ringmasters’ of some high-spirited illustration workshops, vibrantly themed exhibitions, some unconventional pop-up events and promoting illustration in all its many forms. We want our events to be animated lively spaces bustling with creativity within the community. Working illustrators often have solitary lifestyles so we want to support and help each other professionally whilst forming friendships within the Circus. We want the group to grow in members by working with other professionals and new budding illustrators. What is the Circus of Illustration? The Circus of Illustration was formed in 2011 and is an informal collective of Bedfordshire based artists that volunteer their time and efforts to promoting illustration locally. We aim to offer a range of opportunities for both professional and amateur artists to get involved. This might mean displaying work at one of our exhibitions, attending one of our informal drink and draws or bringing the kids along to one of our exciting children's workshops. Who are the Circus of Illustration? 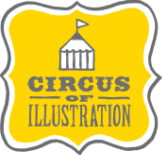 The Circus of Illustration is run by a committee of four volunteers - Kristina Bullen, Katie Allen, Marisa Straccia and Andrew Foster. The committee is made up of individuals who, over time, have shown themselves to be dedicated to, and expressed an interest in, furthering the Circus' goals and ideals. We meet monthly to plan upcoming events and discuss future opportunities to bring illustration to Bedfordshire. Other than those on the committee, the Circus has no official membership. In essence the Circus is anyone who's ever come along and participated in one of our events. If you're eager to get more involved, simply come along and join in. If you're interested in joining our committee, show us you've got the right stuff and simply ask! The best way to keep up to date is by joining our mailing list. That way, you'll receive a monthly newsletter informing you of upcoming events and opportunities. Alternatively, follow our Facebook and Twitter pages for news, photos, drawing challenges and all manner of other bits and pieces! How are the Circus funded? Predominantly the Circus is funded by the generosity of our committee, any contributions we receive at our drink and draws plus a few grants we've managed to find along the way. We have also been able to top-up our small kitty through the sale of our foldees and zines. All funds received go back into the Circus to pay for materials and the delivery of our workshops.